Split from its river by the 19th-century arrival of the railway, the Portuguese town of Vila Franca has been made whole again by Lisbon architect and designer Miguel Arruda. His library and its connecting bridge straddling the railway tracks is at the same time the latest in the new generation of Great European libraries. For 158 years the Portuguese town of Vila Franca de Xira hardly saw the wide flowing waters of the river Tagus beside it, or the salty green marshlands stretching away from the banks opposite. The English had separated town from water. In 1852, entrepreneur Hardy Hislop established a London company to build Portugal's first railway. Four years later, trains ran between Lisbon, just 25km downstream, and Carregado, a little further inland from Vila Franca. The tracks cut off all but factories and a cluster of Vila Franca's riverside buildings from the town. 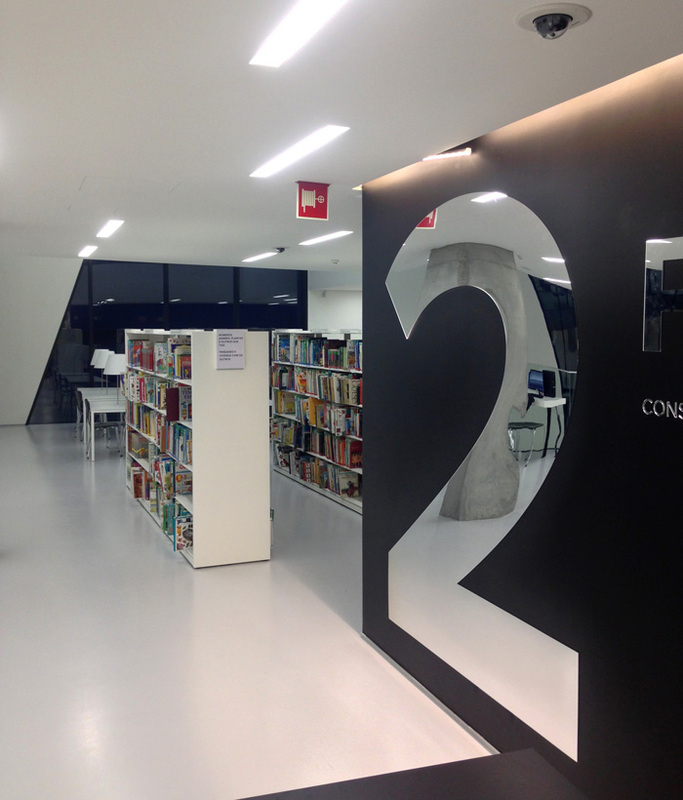 But since September, a new library project by Lisbon-based architect and designer Miguel Arruda has physically bridged the divide. 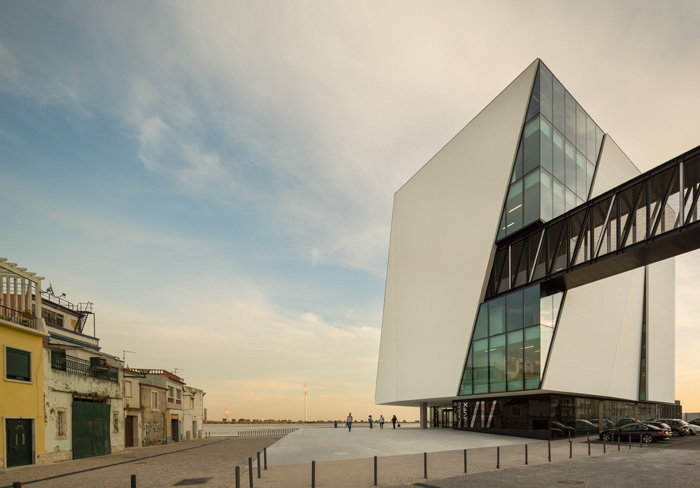 The new library at Vila Franca, by the river Tagus, faces old buildings across a new plaza that will host outdoor events. 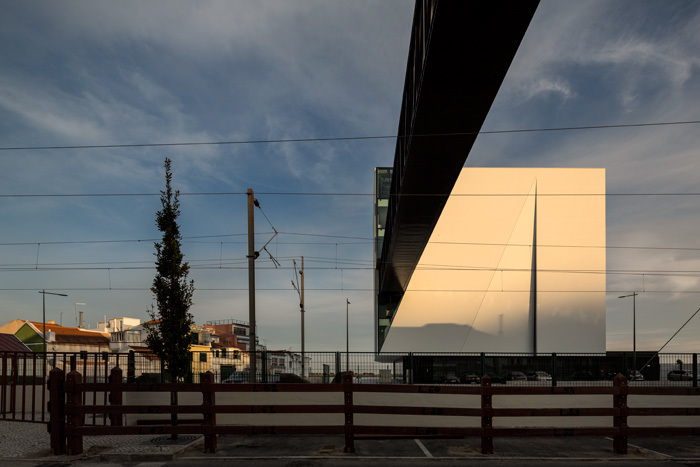 A bright, geometric, waterside building, 26m high, connects via a gangway running through a muscular band of steel, straight as a laser and projected 51m over the rail tracks and a car park, to a minimalist access tower on a town street. Arruda does not stop there. 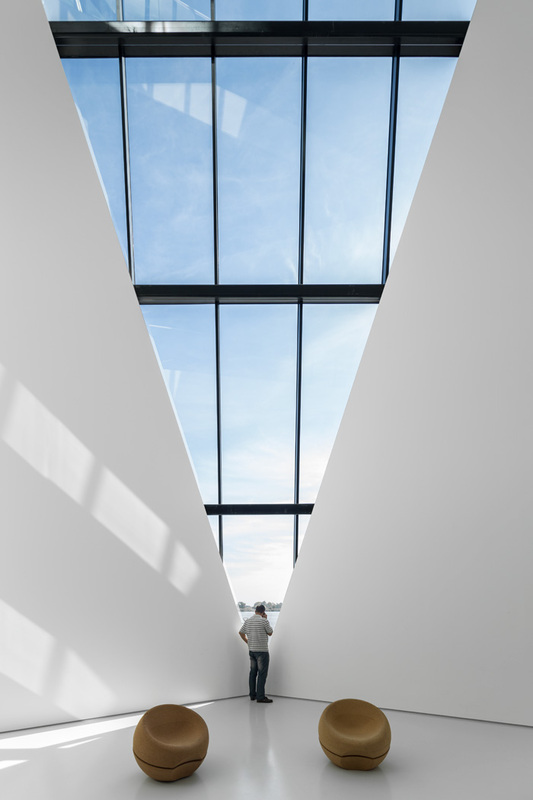 In the library volume, his manipulation of space and the interface between inside and out seeks to reconnect the town's population to their own town by deliberately transforming their visual perception. At the library, 'you are a spectator and a player', Arruda declares. 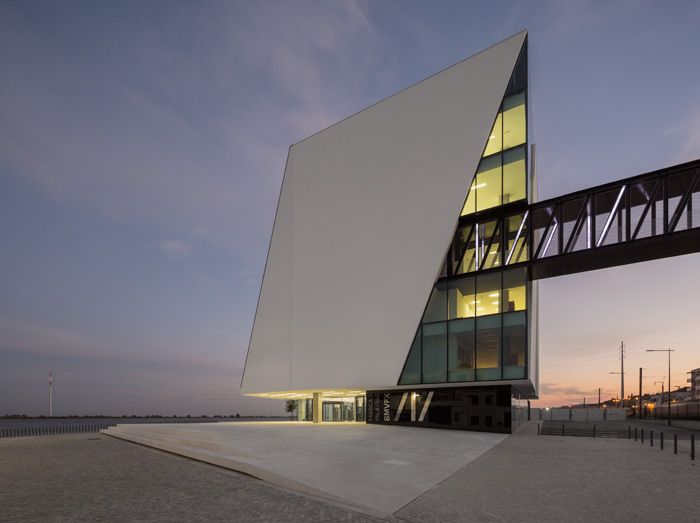 The Municipal Library of Vila Franca is not just about space and connectivity; Arruda sees it as nothing less than 'a cultural upgrade' for the town. Not that Vila Franca was without culture. It is home to bull-runs, like Pamplona but without the tourists (and in the town's bull-ring arena, as elsewhere in Portugal, the bull is not killed). Other town diversions are found in the only other feature of similar height and mass to the new library, a marble-clad, post-modernist block proclaiming Bowling and Bingo. Both rise above the pitched terracotta roofs that stretch to humdrum mass-housing blocks, a motorway and the hills beyond. This is an industrial town, with little to offer compared to cosmopolitan Lisbon, whose orbit it is in. But since opening, the new library has tripled user numbers compared to its predecessor, and it now hosts a cultural programme that includes cinema and regular chamber music performances by members of the Metropolitan Orchestra of Lisbon, brought to the town by its executive director António Mega Ferreira, a national cultural figure and one of the key movers behind Lisbon's World Expo 98. This new injection of culture is signalled even before you cross the tracks. The starkly modernist town-side access tower is marked by lettering by graphic designer Ana Lia Santos. With abbreviation suggestive of the Romans, it proclaims BMVFX (the library's full name -- Biblioteca Municipal de Vila Franca de Xira) and FÁBRICA DAS PALAVRAS, meaning 'word factory'. The same letters mark the entrance to the library itself. They subvert preconceptions of the library, rather like David Adjaye with his 'idea stores' in London's East End. Arruda is not just paying respect to Adjaye -- 'he is very important for me,' he says -- he is also acknowledging the large factory with silos, previously on the library site. The access tower is essentially a concrete box slab open on one side, housing stairs in steel and glass and a lift rising to the mesh-sided bridge. 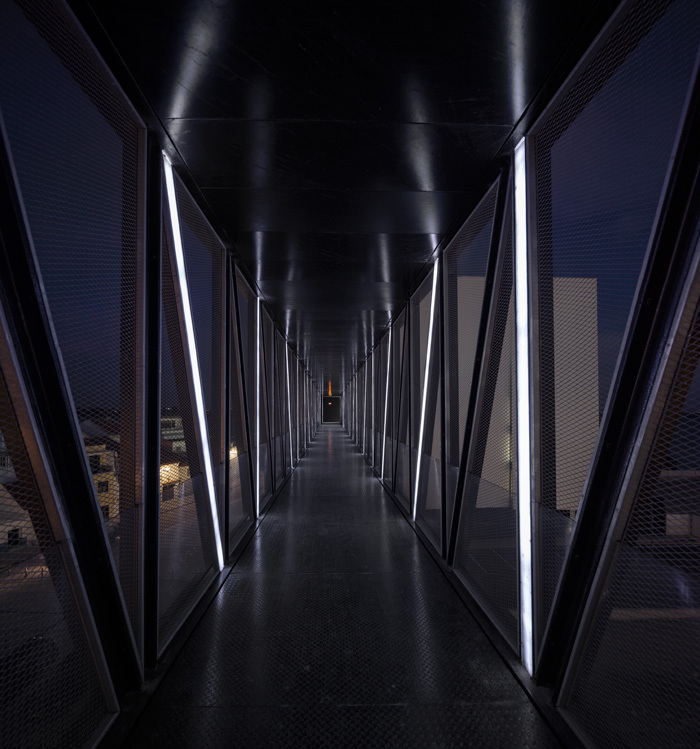 At night, dispelling the darkness in its cavity, a three-storey strip of embedded white neon shines, angled parallel to neon strips along the square-tube of the steel bridge, and crucially, to the windows of the library volume, which the bridge penetrates. There, connecting stairs are separated from the library floors, which are each revealed through full-height glazing. To enter the library itself, users need to descend back to the ground. The entrance is from an apron that extends to the old plaza of Largo Mário Magalhães Infante, but is a few steps higher ('it lifts the library,' says Arruda). In summer, those chamber recitals and outdoor cinema are planned to take place on it. The library's bold new form faces a counterpoint across the extended public realm: a row of traditional Portuguese vernacular houses. The effect is not dissimilar to that at Paolo Mendes de Rocha's new plaza around the Museum of Coaches in Belém, although the geometry is different. At Vila Franca, the space is also open to the water. Adjacent to the library, Arruda designed a section of the riverside walkway with continuous benching, opened in 2011 and which will eventually fit into a 20km network. 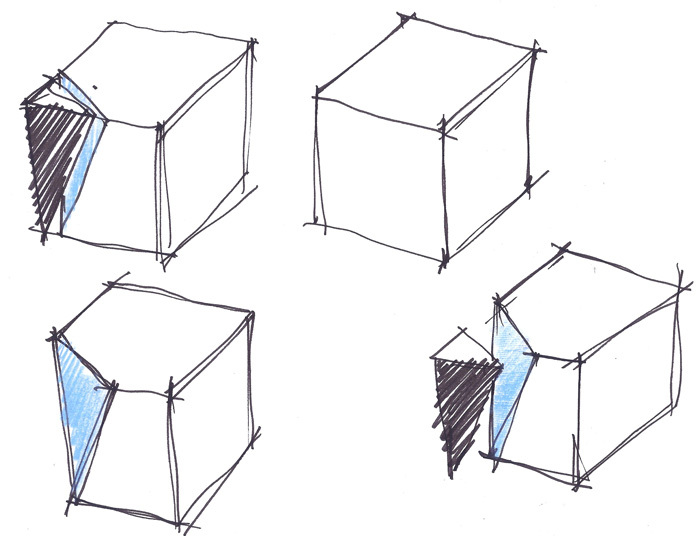 The library volume began with the concept of a cube, one of four basic forms that literally shape Arruda's designs ('every time', he says), along with the cylinder, sphere and cone. Their pure geometry imparts an eternal quality, and marks the influence of the architecture of Aldo Rossi on Arruda. 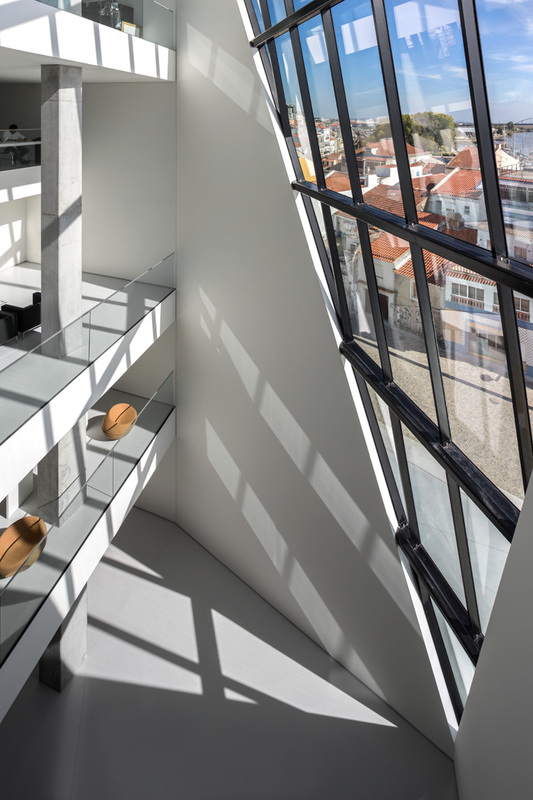 At Vila Franca, the cube floats above a recessed, glass-clad ground floor. 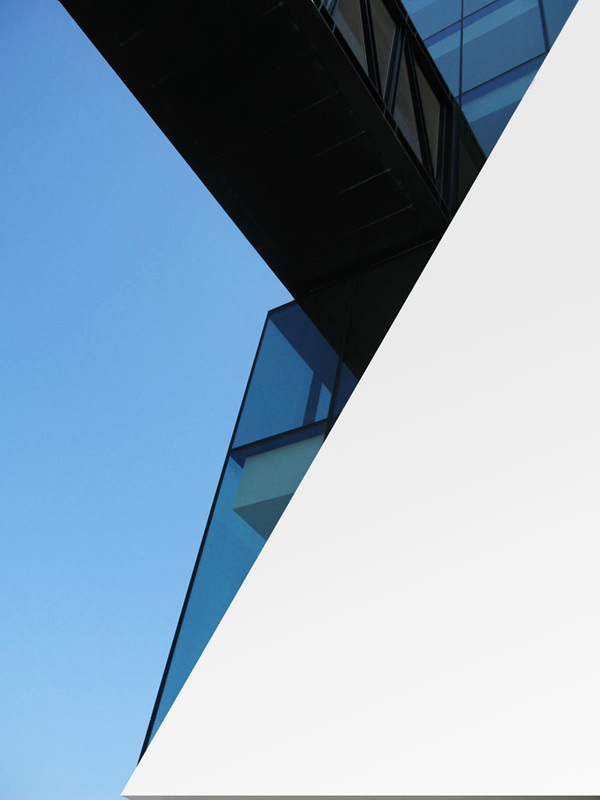 The cube is solid, clad in white and six storeys high, but has been opened up with full-height, glazed, triangular windows. The narrowest of these faces the railway, a recessed sliver narrowing upwards at just 12 degrees. An entire edge of the cube has been sliced off, creating the largest window, a full-height facet of an inclined isosceles triangle, rising from the point of the lower, north-facing, riverside corner to a wide horizontal cut diagonally into the square roof above. Parallel to it, on the adjacent inland corner where the bridge enters the volume, another diagonally edged area of glazing leaves a solid trapezoid of white facing the plaza. From afar, it evokes a sail. 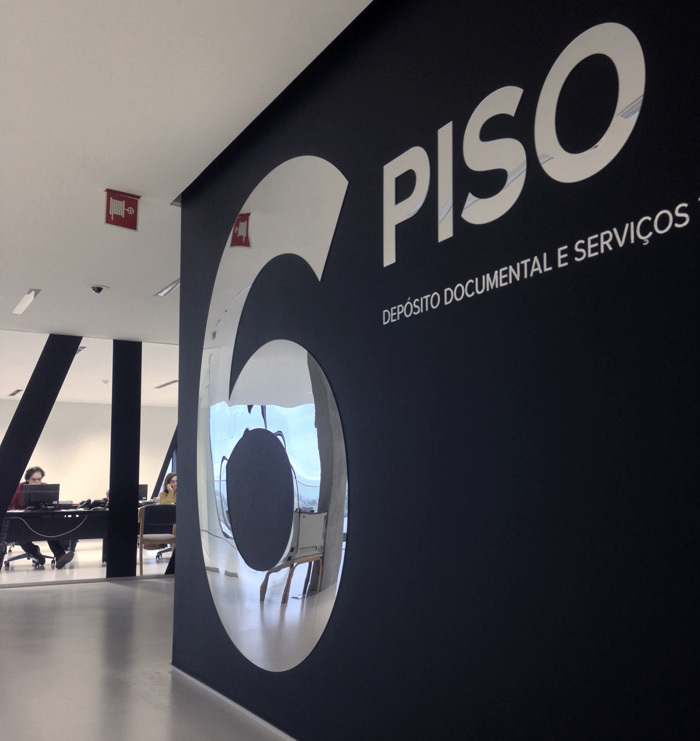 Entering the ground floor from the plaza, a 2m black zero on a mirror wall in the modest lobby resonates with the shape of the circular reception desk and a curl of bench before it. These black fixtures are Arruda's design, and the zero part of Ana Lia Santos' internal lettering -- on higher floors, the numbers are mirrored, and background black. There is a 125-capacity space for conferences, and an open set of stairs rising just one storey. Ascend it to the first floor and the spatial drama really begins. Here, the white interior is flooded with light falling into an atrium through the huge V of the corner window. All five library floors above cantilever into the void as terraces, but their angled edges are staggered, not stacked parallel. For performances such as the chamber music, 25 people can stand on every balcony but the top one, and a further 50 on the atrium floor. But when the space is not cleared for events, the floor is graced by a handful of Arruda's cork Spherical Chairs, designed for the 2010 Milan Triennale DesignCafé for Swiss-Portuguese company Movecho. 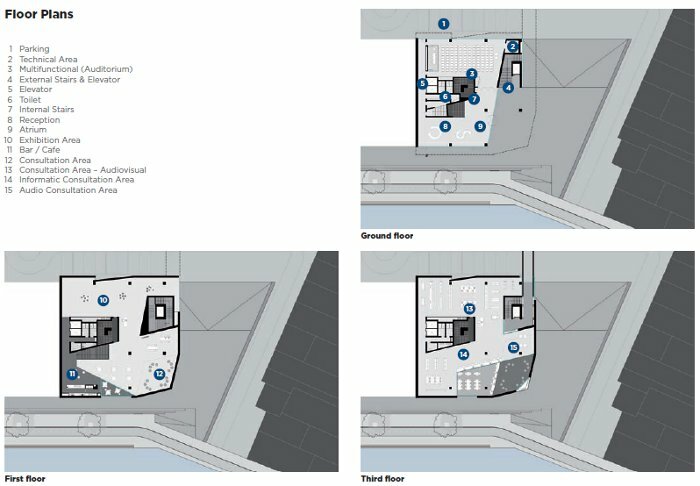 Under a ceiling on the river side is a small cafe, with its own balcony recessed in the base of another triangle of glazing. Also off of the atrium there is an exhibition area, with a cluster of Arruda-designed cylindrical, cork stools. The library proper is above, accessed in an internal core. The second floor has sections for children and infants, and play-spaces. The access bridge passes beside the third floor, and readers can see people pass by through it. By the fourth floor, the views have become spectacular; the town below is revealed in a panorama, while the great triangular riverside window has widened to offer the river and the great multi-steel-arched Marechel Carmona bridge. The fifth floor views are better still, but here are back-office, and on the top floor, archive and plant. This then is an open library, spatially and socially. The social gain could have easily been lost in the regime of extreme austerity measures imposed by the 'troika' of the EU, European Central Bank and IMF, when Portuguese spending on public projects was tight; the Museum of Coaches in Belém remains unopened because of cuts. 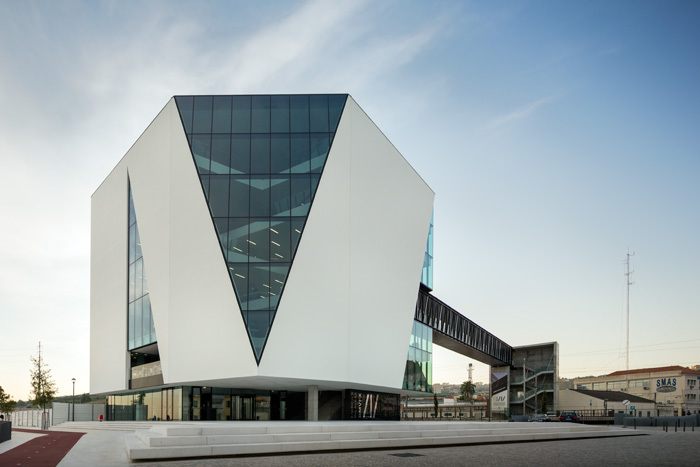 But Vila Franca's library came in with a tight budget of €5.8m, and opened just as the troika era ended. 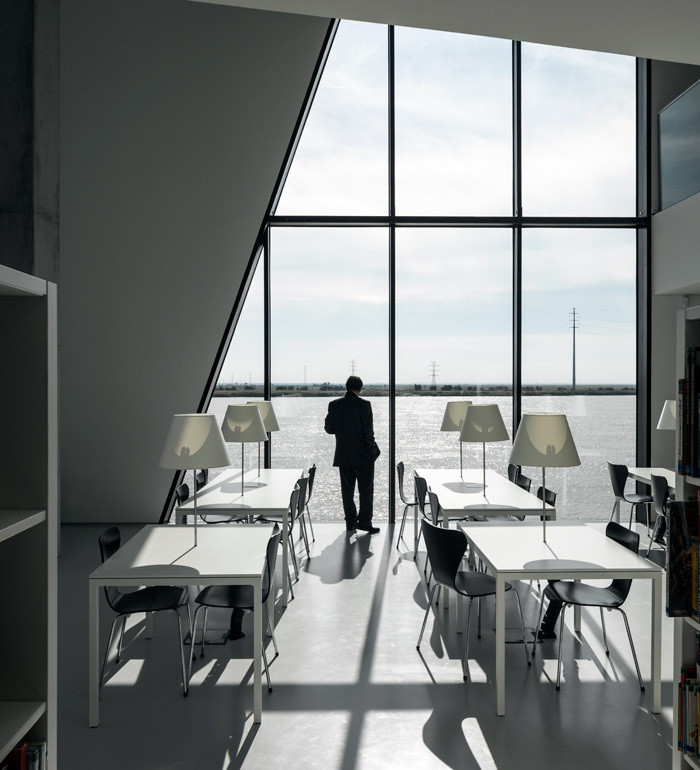 It joins a new generation of recently completed great European libraries, from Birmingham to Riga. One common feature in these is the signature atrium, bringing drama and light to their interiors. But there's a big difference at Vila Franca: Arruda's atrium is open to the exterior across its full height rather than just at the skylight. That's a different dynamic, and it also distinguishes the building from a project which at least in form has superficial similarities -- Rem Koolhaas' Casa de Música in Porto. That, too, is a geometric solid of rectangles cut by angles and glazing, but there the user experience is internalised, made independent of its surroundings (plus, the entrance can be elusive). At Vila Franca, external and internal unite. Arruda brings the great sweeps of townscape and river into the very heart of the building. 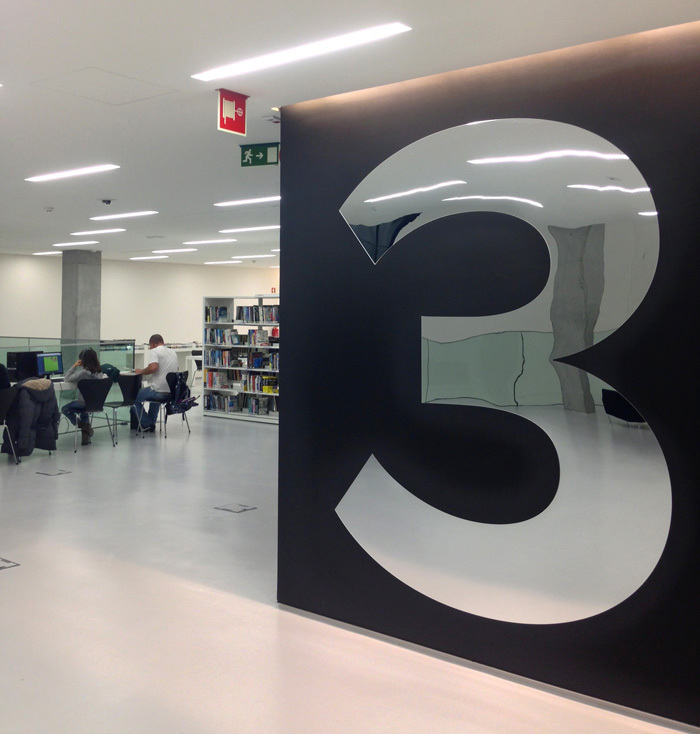 That trick is the foundation of how the library opens itself to the people. Plus, the entrance is obvious. Either side of it, there's a fantastic new space for culture.